My household doesn't regularly drink coffee, but we occasionally want to provide coffee for our guests, or need to use coffee as an ingredient in other dishes. We do have a coffee maker (a "free" one with a subscription to mail order ground coffee beans) - but it's been sitting the garage for ages. It's now dusty, and requires too much cleaning and counter space for the intermittent times when we do want to use it. What's the bare minimum of easy-to-maintain equipment that I could use to produce plain old coffee? I'd pick up a simple cone filter at the local coffee shop. Insert a paper filter, add grounds, pour hot water through. If your guests like Italian coffee you can buy a Moka. This is ubiquitous in Italy, where it is called la macchinetta - the little machine. Every household has one, or often more then one, with different sizes. 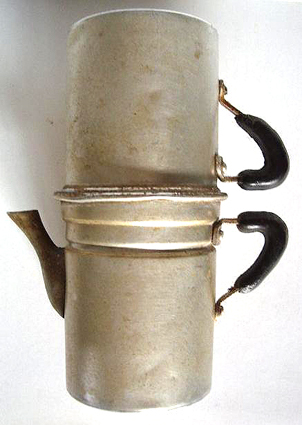 The classical one is sold by Bialetti, and it looks like this (now they sell more modern-looking one). Personally, I don't think the brand really matters so much although, as many Italians, I use Bialetti for sentimental reasons. Screw the top reservoir (C) onto A. Put on a stovetop and wait for the water to boil and pass through the coffee powder. The coffee will accumulate in C. You will hear a typical "gorgling" sound when the coffee is ready, due to the fact that there is no more water left in A. If you're using a gas stovetop, don't use too strong a flame, otherwise the plastic handle may burn! Mainteinance is easy: let it cool down, disassemble it, remove the grinds (use them as compost for your acid-loving plants! ), and wash it under running water. Never use soap. Be sure to remove the ground that sticks to the rubber between A and C, otherwise the two parts may not screw well together and coffee may spill out. Tradition wants that you should not over-wash a moka, as coffee will taste better the more (and more often) you use the moka. Many people would go as far as throw away the first batch from a moka that has not been used for a while (remember, coffee is an after-lunch/dinner ritual in Italy and people will argue about it if it is not good!). Dry the moka and store disassembled, to increase the life of the rubber band between the two reservoirs. 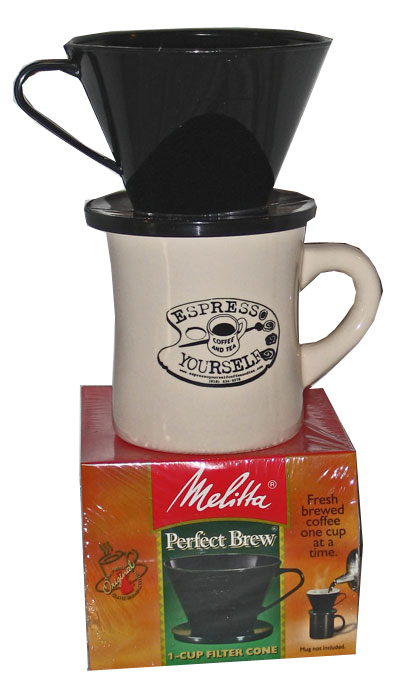 Moka are cheap and come in different sizes, from 1-cup to 10-12 cups. Of course the number of cups depends on how much you put into each one: Italian coffee is usually served in very small cups and it definitely is not what you get at Starbucks, both regarding volume and taste. It may be served black, with sugar, with a dash of milk (caffè macchiato), with a dash of grappa (caffè corretto) etc. Note that this is NOT espresso. The moka does not have sufficient pressure to make espresso. This is what is usually drank at home, rather than at the bar, where you would instead get espresso from a high-pressure machine. Apparently this is called Flip-over coffee pot in English, this blog page describes it quite well, and also has a video. As Eduardo says, [making coffee is] the poetry of life. I was in the same situation as you, and I bought a French Press, as someone else suggested. Very few parts, easy to clean, takes up very little space, and my boyfriend (who is the coffee drinker) says it makes great coffee. The one drawback seems to be that the steeping process gives you a product that isn't as steaming hot as a coffee maker does. I suspect the problem may be that the glass canister does not hold heat as well as say, a porcelain teapot. My boyfriend compensates for this by filling the glass with the hottest water he can get out of the tap while the water is coming to a boil. He also pre-warms his coffee cup by filling it with boiling water while the coffee steeps. I personally use an Aeropress. It's cheap, quick to make decent coffee, super easy to keep clean. It requires a small filter (I bought a pack of 250 or so when I first got it 18 months ago and am only just running out now. The finished grounds are pressed into a "puck" which can easily but put into the bin/recycling without filling your bin with water which can happen with some coffee makers. It's better (in my opinion) than a french press or filter as it is quicker and uses some degree of pressure which should allow more oils etc to get pushed through into your cup. It's also very easy to keep in a cupboard - it's barely bigger than a large cup. If you do invest in one, the inverse method (check youtube) is meant to give even better results than the standard procedure but for me makes a bit more mess. Cezve is an easily cleanable pot that allows you to make Turkish coffee, which, in my opinion, is the best method overall and by effort/result ratio. The complete unshortened process is hard, but it is worth it, plus all you need is the cezve. Wash the glass with hot water and wipe it dry. Put 3 tea spoons of coffee (20 grams) into the pot. When the water boils, stop heating the kettle, wait for 10 seconds and pour it into the glass. Stop pouring when it reaches the upper ring (or two fingers below the top). Quickly and thoroughly stir it with a wooden stick or a spoon. NOTE: don't use metal spoons because the glass is very fragile. Seal the glass with the plunger, don't leave the tip open. Wait exactly 4 minutes (adjust the time later). Push the press, rotate the cover, get the coffee. Drink the coffee and clean the device. Filtered coffee IMO is not much better than instant coffee powder. You can make coffee in a saucepan or some kind of pot that you can boil water in. I use an enameled cast iron pot by Staub but anything that won't absorb the coffee flavor will work. Measure water and coffee to your preferred strength and bring to a boil on the stove. I turn it off as soon as it starts to boil and reduce the heat to very low to keep warm. The coffee can then be poured over a cone type filter or directly through a cloth or paper towel which can then be immediately discarded. When finished with the coffee, just dump the grounds and rinse the pot. Some even prepare the coffee and water the night before and let it sit overnight then warm it in the morning. French press or filters are pretty easy and don't need much storage space. You could also just use a regular pot or saucepan, although that can be really tricky at first, and might be more trouble than it's worth. You could get one of those little moka stove-top coffee makers though. They're pretty convenient and don't need much storage space at all. This sort of adds one more element, but has other, non-coffee uses also, and won't make the coffee process any more complicated: an airtight, hermetically sealed jar in which to store the coffee so it'll keep longer term even with infrequent use. Not the answer you're looking for? Browse other questions tagged equipment coffee or ask your own question. How can I make coffee syrup with caramel taste? How to make a strong mug of instant Coffee? How to make a strong mug of filter coffee without any Coffee machine?